Last week was Kids Clothes Week (don’t count of me for timely news or reminders) and I really tried to sew along. Really, the whole thing is about devoting an hour to sewing a day for a week and that’s not so bad, right? I very much wanted to keep sewing my way through some of the fabric that I picked up recently and I feel like I’ve done a good job of that this summer! I only have two or three more yards that I should really try to do something with. Not too shabby. First, the nautical dress with the anchor applique. I used a vintage McCalls pattern (that came complete with three iron-on transfers that are still begging to be ironed on to something) to make a simple A-line jumper. Then I dyed a white cotton dress that I picked up. I was shooting for an ombre effect which I achieved with moderate success. I used a denim colored dye and the sailboat applique seemed fitting. Finally, only three years after picking up the issue of Stitch magazine that featured the pattern, I made the Oliver+S ruffle halter. I love it. It’s not exactly right. I had a number of make it work moments. I wanted to badly to use this gray bias gingham but the ruffles are cut on the bias so I lost the whole effect. (Haha, that’s funny grammar but not inaccurate.) I want to list all the ways that I botched this pattern but they are too numerous. You can see that the proportions are a bit off in the photo and that’s from all of my meddling. The O+S patter itself, as always, is fab. I will probably make another one of these before the summer’s over. I just wish it hadn’t taken me three years to finally get to it. That’s a little ridiculous. I love this picture. It’s my favorite of them all. Kristy, you won! Thanks, everyone for following the Roly-Poly-Along! That was a lot of fun. You can catch up on all three weeks (15 posts, wow!) of the Roly-Poly-Along here. That’s a wrap! 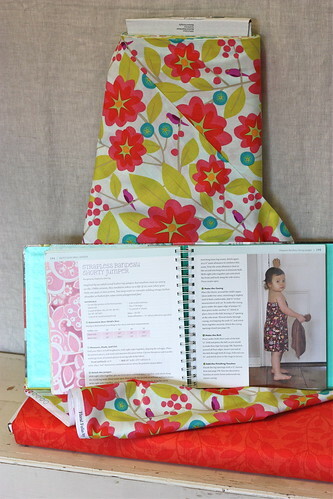 Imagine Gnats is doing a great blog tour to launch of her new Roly Poly Pinafore pattern. I wrote all about the one I made during Kids Clothes Week here. It’s a great, easy pattern with clear, well-written instructions and we get TONS of compliments on it wherever we go. Aside from the extreme cuteness I like that, for a baby, it can be worn with or without a shirt underneath depending on the weather. I know it’s going to get lots of use this summer. The best news though? I have a copy of the pattern to give away to you! Just leave a comment below to be entered to win and tell everyone your ideas for the fabric combo you will use on this reversible pinafore. For another entry like NeurosesGalore on Facebook and leave a comment here telling me. I’ll choose a winner at the end of the blog tour 5/31. Here’s the whole blog tour schedule. I can’t wait to see what everyone else made! There’s lots to see in the Imagine Gnats Flickr group too and if you (sad face) don’t win, you can buy the pattern here. Ohmygoodness! My girl Rachael developed this pattern and was sweet enough to send me a copy. I was nervous. I’ve never really sewn anything from a pattern that I printed at home. After I printed the pattern I was still nervous. I couldn’t tell, just looking at the stack of paper, how it was supposed to go together but it’s all in the instructions. I was so happy! It took no time at all to put the pattern together after that. I was even inspired to trace the pattern for the size I needed rather than cutting out the paper so now I can make one for Avery without printing it out again. I am super happy with how this turned out! It’s cute, cute, cute on the baby. I put it over a teeshirt and bloomers but in the summer it will be fine for her to wear it without an undershirt (I don’t know if bigger kids can pull that off). I didn’t add the pockets so I cut it out in just two pieces. It’s a lot of sewing but it’s crazy easy to put together. I was able to put it together in a single evening. Though, as always, I may have skimped on *ahem* attention to detail. That was a lot of top stitching! But I know you’re up for it. I also had to fudge the straps a little so I did the buttons and button holes backwards. Meaning the buttons are on the back straps instead of the front. In short, there were some hang ups but they were all of my own making. The pattern is great and instructions are totally clear and easy to use and follow. I’m so glad that she encouraged me to try this pattern, I love it. It’s also cool because it’s reversible. The hexie fabric is a yard of Quilt Blocks fabric that I think I picked up at G Street by Ellen Luckett Baker and the floral reverse I bought at Mood while I was pregnant. I’ve used so much of my stash this week that I treated myself to a yard of new fabric today! But just one. It’s Kids Clothes Week! This time I didn’t even sign up (because keeping it real). HOWEVER, I did happen to make this romper and it does happen to be KCW so I’m calling it even. I just won’t bother to title the post “Day 3!” as if I’m even a little bit optimistic about their being any subsequent days. I’m just sayin, maybe there will be any maybe there won’t. 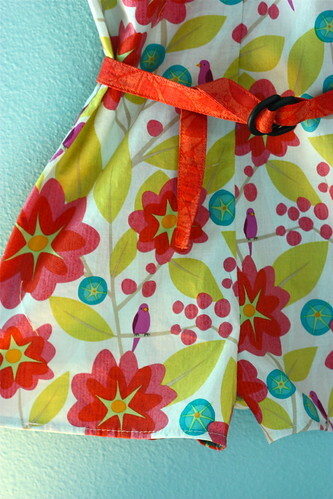 I can’t decide if I should make another romper or try one of the little tunics. I’m thinking another romper in a light gray bias gingham that I have no other plans for. It turned out great! It’s been so fun following along. Hop over to Pink Chalk to check out the other finished jumper too. Good stuff. Apparently the shorty part is a surprise to people. I know what it’s supposed to look like so it never occurred to me that the profile view in the published photo doesn’t really show that. Anyway. Surprise! So I mentioned a while back, and maybe over and over again, that my pattern was coming up in the sew along that Pink Chalk Studio is hosting. Well it’s finally here. It’s kind of a thrill, getting to see what other people put together and how that is the same or different from your own vision. This is my first published pattern and I’m not at all used to sending my work out for other people to use. That took a little time to wrap my head around and so did not TOTALLY freaking out about what could possibly go wrong. I did that for a while but I know now that it will be fine and I’m really looking forward to seeing the finished product. I love the fabric choice up at Pink Chalk, this should be really sweet. And while we’re getting a little shameless self-promotion out of the way, the next book comes out in November and I have a super cute project in there too! I mean honestly, it’s nice to hear someone say you’re awesome every once in a while even if it’s just you. I’m not even sure if that clip is totally relevant but it’s a classic so watch it all the same. Anyway, I’m totally embracing this. So, in the spirit of sew along I thought I’d post some links to some of the jumpers that some gals have already put together here, here, here. here. and here.